Jesse Cole’s motto is “Normal gets normal results.” As the owner of a minor league baseball team, he does what he has to to get butts in the seats for games… leading to record-setting attendance (and revenues) that has garnered national media attention. And, along the way, he’s discovered a way to create amazing experiences that turn customers into raving fans… and evangelists that become your best marketing team. He packs it all in his philosophy for his company, Fans First Entertainment. 00:11 Today Steve speaks with the Yellow Tux Guy, Jesse Cole. He’s the founder of Fans First Entertainment and the owner of the Savannah Bananas baseball team. 02:01 Jess tell us how he loves baseball, but hated coaching it. He ask what business are you in and what business are you really in! 05:58 Jesse tells us how it’s more important to love your customers than your product. 06:42 Jesse explains how he turned around his baseball team by breaking all the rules. 08:31 Jesse explains how he got serious baseball players to dance. 10:31 Jesse tells us that if you’re not being criticized then your playing it too safe. 15:29 Jesse explains his very simple core principles and how he instills them throughout the company. 18:48 Jesse explains why he works from the top down. 20:16 Steve tells us about his own experience in repeating his company’s mantra. 21:36 Jesse talks about the long game. 23:42 Jesse talks about the comparison trap. 24:51 Jesse talks about how he works with other companies. 28:05 Jesse explains how to apply “fun” to otherwise “boring” companies. 30:09 Jesse tells us how best to get in contact with him. 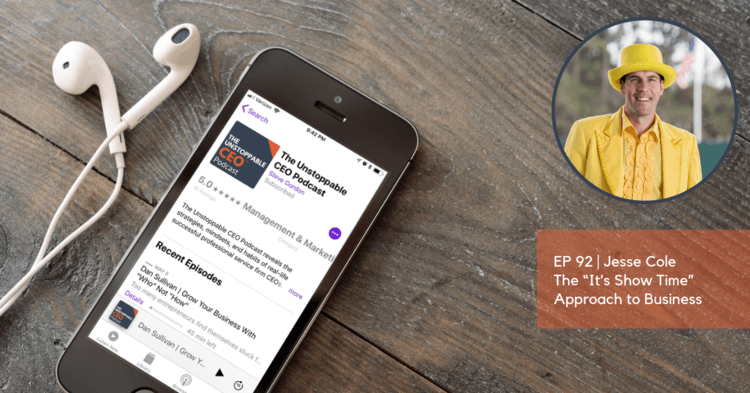 Welcome to The Unstoppable CEO podcast. I’m your host, Steve Gordon. And I’ve got to tell you this is probably the most unique interview we’ve done, and we’ve done 80+ interviews. This is going to be exciting, particularly if you care at all about your customers. And I know that you do, so pay attention. If you’re not driving go get a pad, a paper, and take some notes as we go through this because I think you’re going to learn a lot from our guest today. Our guest is Jesse Cole. He is the Yellow Tux Guy and founder of Fans First Entertainment. He is the owner of the Savannah Bananas baseball team. And what’s really interesting. If you haven’t heard of him before, you’ve got to go look him up. What’s really interesting about what they’re doing is they’ve brought more than one million fans to their ballpark. He’s been featured on MSNBC, CNN, ESPN. And for a minor league baseball team, they’ve got sold out games now for two straight seasons, and a waiting list for tickets in the thousands. And Jesse, I am super excited to have you here. I know there are some NFL teams that can’t boast what you can boast. And some major league baseball teams that boast what you can boast. So welcome to The Unstoppable CEO. I’m excited to be with you. And you called me the most unique guest. I’ll tell you, I’m a fan of the show. You’ve had some great guests. I may be the only one with a yellow tuxedo, so I’ll definitely give you that. Yeah. I think that is certainly true. And I know as we go forward I want to talk a little bit about what you’re doing with Fans First Entertainment. I want to make sure we talk about your book because I think that’s going to be really helpful for people. Before we get into all of that, I would love it if you give everybody that’s listening just a little bit of your background beyond the stuff that’s in your bio. Help them understand how you got to this stage in your career. Of course. I’ve been on a wild journey. It’s a love of baseball that started when I was a kid. My father bought a baseball facility up in Massachusetts so I could actually go there and practice. And I was there all the time and just fell in love with the sport of baseball and was fortunate to get a college scholarship. Went down to Wofford College in Spartanburg. And by my third year I tore everything in my shoulder. And that ended my whole dream of playing professional baseball. And so I thought I was going to get into coaching. And I went into it, and I realized something just coaching for a short period of time. That I loved playing the game but I hated watching the game. And I thought the game was too long, too slow, and too boring. So what did I do? I took a job actually working for a baseball team. At 23 years old I became a general manager of a small team outside of Charlotte, North Carolina that was failing. And I realized that we had to turn it into something different. And the question that I ask right now when I’m talking to business owners is what business are you in? Or what business are you really in? And I learned right there in Gastonia, North Carolina with a team that was failing. Two hundred fans coming to the games. I mean there was only $268 in the bank account on my first day. It was the worst, Steve. And I realized that we had to make it all about entertainment. And that was the business we’re in. We started putting on a show. Literally our players started doing choreographed dances. We had grandma beauty pageants. A flatulence fun nights. You name it. We tried everything. And we learned it started to work. And so we built that team up, eventually bought it. Just recently sold it. And then came to Savannah, Georgia where professional baseball had been there for over 90 years but had failed. They couldn’t draw fans and so professional baseball left there. And us at the lowest level of baseball, college summer baseball, decided to throw our hat in the ring and give it a shot in Savannah, Georgia. And what happened was a complete struggle in the beginning. We couldn’t sell any tickets. But then we went all in on creating attention, creating the best possible fan experience. And it has been a rollercoaster. But, you’re right, it sold out every single game. A wait list in the thousands. They’re scalpers outside of games. And it’s something based on creating this what we call the Fans First experience. So that is the short, Spark Notes version. And today, just fortunate to be out speaking with groups, working with them on how to create this amazing experience, and how to create some attention and have fun. So I’m living the dream, having a lot of fun, but still learning every day. It’s a journey with a lot of challenges, I’ll tell you that. And one of the key things that I think made us successful in that business is we always elevated that question. We said, “Yeah, we do this stuff, but nobody really cares about that. Nobody buys that. They’re buying this other thing over here.” It was a little bit different for every client. And I think for folks listening that’s a really, really important question. I’m glad you shared it. So this has clearly not been an easy road. You started with under $500 in a bank account, the company had at your very first job, and you built that up to success, and ultimately sold it. And now you’ve started again in an area where there was a failing team. And now you’ve brought that to success. That’s not an easy road, I wouldn’t imagine. It was brutal. My wife and I three years ago we were sleeping on an air bed. We had to sell our house, empty out our savings account. It was an unbelievable struggle, but I wouldn’t have had it any other way. I know when you talk to entrepreneurs it’s going through those challenges that made us really go all in on the experience and believe in what we were doing. That’s been the road for us. And it’s really come into this fascination of loving your customers more than loving your product. And when we shifted that, that’s how we’ve really been able to stand out with everything we do. So when you were going through those early days, what kept you going? What was it that you said, “Hey we’ve got something here. We just need to persevere with it”? I say it all the time, but whatever is normal, do the exact opposite. And we realized we had something that wasn’t normal. We just had to create attention. I think normal gets normal results. What we realized is that to many people baseball was long, slow, and boring. Everyone was competing on the same thing. Wins and losses. Well, we didn’t want to play the same game. In the beginning I was trying to break the rules, now we’re just trying to make our own rules. And we’re competing solely on the entertainment experience solely with ourselves. What happens is when you focus so much on … I mean during our games our players do choreographed dances. They hand out roses to little girls in the crowd. We have a senior citizen dance team called The Banana Nanas, a breakdancing first base coach who dances in the middle of the game, a pep band. We’re so focused on the show experience. What happens is we fill up our stadium and the players end up playing better because of the atmosphere. And then the wins, losses, revenue, everything else takes care of itself. So we knew we were doing something that was abnormal, that was unlike anyone else. We just had to be able to create the attention and get them to see it. Once they were able to see it, we’ve been very, very fortunate. We’re still learning. We have a 1926 ballpark. I mean it’s one of the oldest ballparks in the country. And it has its challenges but people don’t notice it. They focus on the fun. I think every business, put on a show. And you’re always on stage. And that’s what we try to teach our people, is that it’s always show time, every single day. That’s what’s pushed up to believe in it because we knew it was something different than anyone else was doing. I’m curious. How on earth did you get baseball players to do choreographed dances? When you went in to have that conversation with them in the locker room, the response couldn’t have been, “Oh, yeah. That’s the greatest idea ever.” I mean there had to have been a little pushback. How’d you convince them to do it? In the beginning there was complete pushback. I mean unbelievable. I had guys walk away, say, “We’re not doing it.” But what happened was the players that were doing it were the most popular players, signing the most autographs. Everyone loved them. And so everyone wanted to be a part of it. And then 2009, we had Russell Wilson, the quarterback for the Seattle Seahawks, play for us, our team in Gastonia. And even he danced during the game. And when he was dancing, everyone was like, “Wow. If Russell’s doing it … “. It’s all about building the culture. Yes. It was extremely difficult in the beginning. But now people know that’s who we are. That’s what we do. And I’ll tell you, I channeled a little bit of myself playing baseball. You’re sitting in the dugout and you’re playing a long season. I mean you play college ball then the summer ball. You’re playing 100+ games. The games do get long. They get boring. But if you can have a little fun, it makes it all worth it. And so now they know that, and we train that from the onboarding. The first day, like anything, we onboard our players and teach them the experience and tell them stories and show them videos. We give them the Fans First playbook on who we are. We don’t just treat them like players playing for the summer. They’re part of our entire culture. So it starts from the first day we bring them in. What kind of conversation had to happen? Because you didn’t just have that with players, you had to have that at all levels I would think. How did you get those people to buy in? You know I believe if you’re not getting criticized you’re playing it too safe. This is the guy, I wear a yellow tuxedo. I own seven of them. I wear them all the time and I know I get criticized for it, but it’s something that we’ve seen to stand out and be different, that’s where you can really have breakthroughs. So to get buy in, it’s easier to get buy in now because of the results. Now when you’re selling out every game and the only one at this level doing it, it makes it easier. But it’s the conviction. It’s the business of belief. In the office I constantly talk about those Fans First moments. And I make sure people understand the purpose of what we’re doing. I share … We’ve had so many stories about how we’ve brought families together. We’ve had tragic incidents where families have lost a special one but the games have kept their family together. And we share those stories. So that’s big into us. I think every company has their core beliefs. But do they have actually a story, a storyboard where they keep all of their stories? And the ones that really bring the staff together, bring their customers together? Stories are everything for us. We call them Fans First Moments. And after every game we share, everyone goes around and shares their Fans First Moments, that they were either created, they saw or they were a part of. So when people understand the deep purpose that goes into all of that, they understand, “Hey, we’re going to get wild. We’re going to do things that don’t make sense. We’re going to do things that are crazy.” But it’s all to get these 4,000 people to feel like they’re a part of something when they’re coming to the ballpark. That’s amazing. So we’re going to come right back. I don’t know about you, but I’ve got some notes going on the side. If you’re listening you should probably be taking notes, unless you’re driving. We’re going to come right back with more from Jesse Cole. And, Jesse, when we come back I really want to dive into your book and really kind of that and the great things you’re doing with events. So we’ll be back in just a second. Hey, welcome back this is Steve Gordon. I’m here with Jesse Cole. He is the man in the yellow tux. Jesse, I want to pivot a little bit and talk about the new book that you have out, and talk about the work that you’re doing outside the ballpark with your company, Fans First Entertainment, and really the message that you’re trying to get out to business owners. So what’s the best place to begin? If somebody is listening, if they’ve never heard of you before, what should they know first? You know really I’m just someone that’s enjoying the show, is along for the ride, and is just trying to have the time of my life while sharing things. And if you follow, search Jesse Cole the yellow tux guy, you’ll find I’m documenting everything. I’m sharing the journey of running baseball teams, but more just running these experiences that we’re trying to create. I try to keep things simple. Our whole company’s name is Fans First Entertainment. Our mission is Fans First entertain always. And every decision we make, we always ask ourselves, “Is it Fans First?” So how I’m working with businesses now is I’m just asking those questions. What makes you different? What makes you stand out? And how can you create the best fan experience in the world? And not just think about them as customers, think about them as fans. So I’m along for the journey. We’re learning new things every day. The book has been really an unbelievably rewarding experience, Find Your Yellow Tux. And I share how anyone can be successful by standing out and share the journey. But really, keep things simple. Love your customers more than you love your product. Love your employees more than you love your customers. And just have fun. And when I put those together, you’re able to put on a show every day, it’s an amazing ride. That’s what we’re doing. We’re having the time of our life. Well, a couple of things. You mentioned the word simplify. And a couple of things jumped out at me in the book. One is the message to simplify, simplify, simplify. The other is the long game. I would love for you to share with the listeners how those play out, and how they might be able to apply those two ideas to get a better experience for their customers, their clients. Sure. Well, I think it starts at the top. What’s the mission of the company? What’s the vision? What are the core beliefs? And that sounds so simply, but my question is how many people can actually know that in their part of the organization? We actually simplified it so much, our core beliefs we go by the alphabet. And it’s kind of a guideline for our people. Always Be Caring, Different, Enthusiastic, Fun, Growing, and Hungry. And we reward that constantly, with everything. First, when people get onboarded we actually have them do a Fans First essay on how they fit to all six of those core beliefs. We have them do a future resume, not their past resume, a future resume. We want to know what they plan to do in the future because that will show us, are they actually growing and hungry? If they want to stay at the same position, then that doesn’t matter as much and they’re not growing and hungry. And then the final thing, we look for a video cover letter. We want to see their enthusiasm. We want to see how fun they are. We want to see their energy. So it starts from the beginning process when we bring people onboard. And that’s for even game day staff, part-time employees, interns, not just full-time employees. Then we’re actually now doing profit sharing where every week we have our people write what was something they did that was Fans First, and what was something they saw someone else do Fans First. So we’ve kept our vision, our core beliefs, and our mission in our everyday life of how we bring people onboard and our employees that are a part of us. So we were talking about simplifying. You know, what do you stand for? Who are you? Can you simplify it? Because if you’re just trying to bring in revenue or grow, you need to be more than that. We have all millennials on our staff, 22 to 27 years old, and they want purpose. They want meaning. They want to feel like they’re making an impact. And I feel we’ve been fortunate to learn this because we’ve had zero turnover since we started. And millennials, as you know Steve, they’re leaving businesses every 13 months is what I saw, the recent statistic. So for simplify, I think it starts at the top. What is your business? What do you stand for? And simplify it in as few words as possible. I think Jeff Rosenblum said it best, “Whoever says the most in the least amount of words wins.” And that’s how we try to keep everything, just a Fans First. So that’s the simplify part. If you want to go into more of that or you want to go into the long game. But obviously that’s a big part of what we’re trying to do. I get that at the top level. Is it difficult then, have you found it difficult to then push that down all the way through the organization so everybody gets it? Yes. It’s certainly a challenge and I think that’s why I believe in working with the leadership as much as possible. We have now 15 full-time, about 150 part-time. And I’ve realized my biggest job, my most important job is to focus on the who and the where. And then bring people into focus on the what and the how. So the who is the right people, the right place. The where is the vision. Where are we going? We actually worked with Cameron Herold on the Vivid Vision to create our plan for the next three years in reverse engineering. And I’m sharing that over and over again and working on our people where they are focusing on how to implement, and focusing on what to actually do. I think a lot of times CEOs get in the middle of trying to do everything. They’re focused on the what, the how, the who, the where. Well, it’s impossible to do that and a great job and be able to actually keep your sanity is what I’ve learned. And so, yeah, I think the key is being repeatable over and over and over again on who you are, what you stand for, what the stories are that matter most. When I give speeches I bring our team to the speeches. I record them. I share it with the team so they can hear me saying the same message over and over again. So they embody it and they’re implementing it. I think leaders, if they keep shifting on what they stand for and what matters to them, then they’re going to have a whole group below them that has no clue where to go, what the next steps are. I share the same things. I mean our staff can repeat me. Literally. They’ll start acting like me. They’ll do imitations of me in the office, which I think is actually great because they know what we’re about. Sorry. And I was just saying, what’s the decision filter? For us, I tell everyone, “Guys, is it Fans First?” If you want to spend $500 on a customer because you believe it’s a real Fans First thing to do, I will always bless that and say, “Go ahead and do it.” And so when you can make your decisions filter go through very easily, that’s when you can have magic and the company can really grow. When they have to come to you and say, “Steve, what should we do here? What should we do here? What should we do here?” But if you can find a simple filter, that’s been a game changer for us. Yeah. That’s brilliant. So let’s kind of turn attention and talk about the long game. I think that is something that people really talk about a lot but mostly ignore. How have you looked at kind of the time scale of the way you’re playing out all the things you guys are implementing? We’re focused on the long term values of the company and to be the most fan-centric company in the world. And we’re not going to go for short term profits. And we need to continue to repeat that over and over again. Or even me to learn that and share that with our team. You know it’s really hard to make that case though. Everywhere you turn it seems like there’s another overnight success. Now they might not all be real. You never know in the world of internet famous. But I think it’s really hard sometimes to sort of steel yourself against that, and I appreciate your sharing the fact that, yeah, you’ve got to check yourself on that sometimes. I mean it’s really easy to come on a podcast interview and say, “Yes, you should play the long game and it’s really, really easy to do. And it’s the right thing. But the fact that you’ve got to remind yourself of it. I mean I think that helps all of us understand it’s a constant thing. It’s like making these decisions. Yeah. And I think one of the biggest killers of the long game is the comparison trap. Especially today. We’re so focused and it’s in front of us every single day the success of others. And people in our same fields or others fields just climbing to ranks that we never even imagined. And that makes us want to get there even quicker to see that. And I keep telling myself, focus more on your customers. Don’t focus on your competitors. And stop comparing, because it’s so easy to get in that comparison trap and see everyone, the Joneses, that are doing so well. That that’ll make you focus on short term growth instead of your long term values and long term plans. So it’s a constant reminder. And I think if you catch yourself comparing to others, that’s going to be something that kills your focus on the long game. So you’ve got huge success with the Savannah Bananas. You’ve got big success with your new book, Find Your Yellow Tux. And I know that when you’re not running baseball games, you’re out helping businesses create exciting events and working with business owners. Tell us a little bit about that work, that part of your world, and how you’re helping businesses there. It was about four or five years ago, I got asked to give a speech at actually a Profit First event, Mike Michalowicz, who I’ve got to know pretty well. And he had me keynote the event. He wanted me to just talk about standing out and being different, so I called it “Find Your Yellow Tux.” And it was a group of about 150, 200 finance people, accountants, people that had never seen a baseball entertainment game. And I was fortunate. I gave the speech and the reception blew my mind. So after that I said, “You know what? There’s a message here that this can work with any field.” So the book took off from there. Started writing it, working with the publisher, working with the team. And since then, it’s been interesting. The groups that I’ve worked with … I’ve spoken to schools, different businesses, entrepreneur groups. And what has really resonated is the Fans First experience and mapping the journey from the fan, from the first time they interact you on your website, for the first time they come to your spot, the first time the work with you, to the last experience, and whether the last impression leaves a lasting impression is something I always say. It’s resonated. And I think why I love it so much is you can see like a homebuilder company that I work with create an experience that is just mind-blowing. From literally when the first time someone buys a house with them, they get a iPad; they get a cooler; they get a video set with everyone celebrating. Then they even have brought couples to have a special anniversary dinner in their not even framed house yet, set up with roses and the perfect music. And they have a red carpet when they close the house and have champagne toasts. And they’ve mapped this experience from the beginning to the end. That’s something we pride ourselves at our ballpark. I mean we call every single person that guys a ticket from us and give them a thank you. Just not calling to say something went wrong. Calling to thank you. And we literally set up our pep band to greet them when they leave. And we have our staff out and our players thanking the fans. That’s what I love more than anything. And combining that with loving your employees more than your customers. We take so much pride. And we say the word ‘love’, Steve. We’re not afraid of it. I think love needs to be used in business more. I really, really love our employees and try to make it the best possible experience for them as well. Can I put you on the spot? I’m on your show, my friend. That’s right. So you just mentioned two words that I think are not associated with one another very often. You talked about speaking to accountants who raved about the speech you gave and all these ideas. And then you just mentioned the word ‘fun’. And it occurs to me that most of us would never equate those two. Have you seen, whether it’s accountants or another sort of traditionally boring business, that has used some of these ideas? It’ll help folks who are listening really make it practical and understand how they might be able to put these in place in their business. Well, some service based companies. So for instance this one company I spoke to, they were called the Geek Glass Cleaning Company. So now he talked about literally having his employees dress up complete like a geek squad, like Best Buy. And now they’re washing houses dressed up like these unbelievable nerds, trying to have fun with it and embrace the name of the company. I mentioned the homebuilder. They, literally the whole staff, did a rap video with them throwing money around a giant pen acting like they’re signing the contract with the person buying a home. And they send that video to everybody. So right when they buy the home, they agree to it, they send that hilarious rap video with people in their 50s and 60s in crazy costumes. That’s the first impressions, that this group is fun, they’re different. I’ve talked to landscaping companies and they’re thinking about busting out a dance in the middle of the whole landscape area at their retail spot. When people walk in, at the hour the music goes on and they all just start having fun. Some of this is crazy. But the reality is I think that’s the starting point. Even an accounting office. You know when you first walk in, is there music being played? Are people being greeted with food and drinks? What is that first impression? We actually have a director of first impressions, and that is her whole focus. When people walk in to give them this special entrance. And even in the off season, not during the game. So fun is very tough to share, Steve, because some people are really scared of it. But what I say is you have permission to be different. Go ahead and do it. I’m a guy who wears a yellow tuxedo, literally all the time. Seven days a week. I’m in the airport where I’m going to give a speech, and people are looking at me like I’m crazy. But you know what? Most people just laugh. And if someone has an issue with you having fun and doing something different, it’s their issue, it’s not yours. And we’ve got to tell everyone that. You have permission to have fun and be different. And I’ll tell you, it’s a lot more rewarding when you do that. All right. Well, Jesse, how can folks find you? How can they find the book? And then they want to connect with you on any of the other things you’re doing, how will they best be able to do that? I appreciate it. I post every single day, LinkedIn, Facebook. Jesse Cole Yellow Tux Guy. And my book’s website is findyouryellowtux.com. I actually have Six Steps Standout, a free handbook, on there as well. But shoot me a note. I love connecting with people in any way I can help. I tell you, I truly appreciate what you’re doing. I’m a fan of the show. You’ve had some amazing, amazing guests. And you’re really making a difference. So thank you for having me on. Hey, it’s been a pleasure. This has been a fun conversation and I’m sure we can go on for a long time on all these topics. But I’ve got to tell you, there’s just so much to unpack out of this. And for everybody listening, I really think that putting emphasis in these areas all around experiences is one of the most important investments you can make in your business. It’s the thing that removes you from all this commodity competition nonsense and gives you an opportunity to really be successful, and frankly have a lot of fun doing it along the way. I know we’ve listened. We’re talking about how we can do more of this ourselves. And Jesse, thanks for sharing all your ideas today. Everybody go to findyouryellowtux.com and find the book. And you’ll find all the links to Jesse’s stuff in the show notes on our website unstoppableceo.net. Jesse, thanks again for being here.